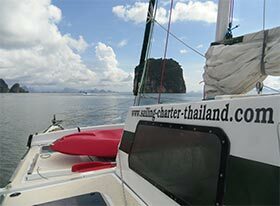 Charter catamarans as most people know them are large, luxurious, have lots of bathrooms and are usually better known for their abundant creature comforts then their sailing abilities. They do motor very well though ... 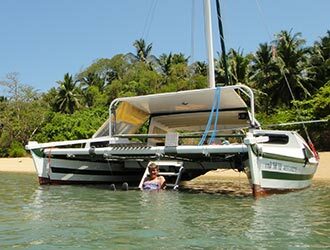 Such charter catamarans tend to be expensive too which in many cases means that people can either not afford to charter a cat at all or that they have to, by necessity, share one with others in order to offset the costs. 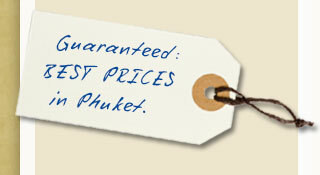 Smallish cats, suitable for just a couple with or without one or two children are actually very rare on the market. In response to requests for such smaller, more affordable cats we added two Wharram Tiki 30 catamarans to our fleet, both custom-built for us. Our Tiki 30's have proven themselves a great success from the onset. They are quick, yet immensely safe and stable and we do not think there is any multihull, which is easier to sail then this one. 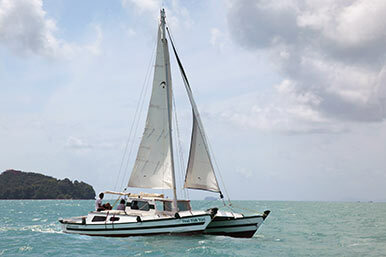 The Tiki 30's ease of handling and shallow draught make her the perfect yacht to explore the hundreds of islands, anchorages, creeks and rivers along Thailand's West coast. 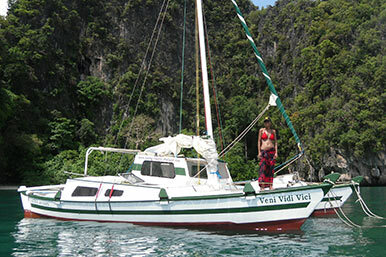 Most of which are out of reach for the average mono hull because she'd run aground. If you'd think that an economy–priced charter cat would be equipped only sparsely then we are glad to prove you wrong: have a look at the 'specifications' section underneath! 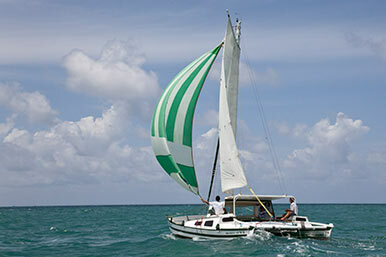 These Tiki 30's are in our view unbeatable as budget-charter yachts! 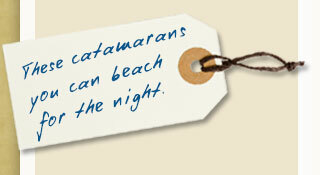 We offer the catamarans for bareboat and skippered charter at VERY attractive rates. 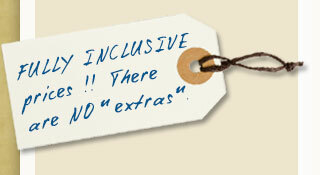 As with all our rates: they are FULLY INCLUSIVE, there are NO extras and they do include a full tank of fuel (100 ltrs). A Tiki 30 has, for a thirty foot boat, a phenomenal amount of usable deck space, lending her the feel of a much larger yacht . Her rig is the famed Wharram Softwing rig. 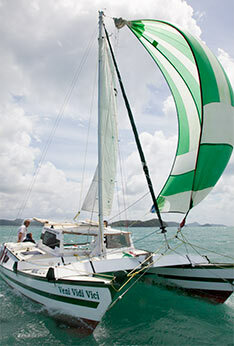 Robust and easy to handle this rig delivers excellent performance on all points of sail . It looks amazingly pretty too. 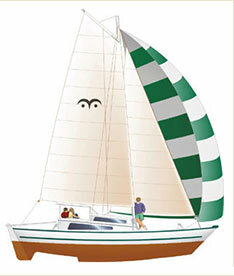 The jib is roller reefed and a gennaker with snuffer is part of the standard sail inventory. Mechanical propulsion is provided by a Yamaha 9.9 4 stroke engine with remote controls and electric start. The 100ltr fuel capacity is sufficient for about 50 hours motoring at cruising speed. 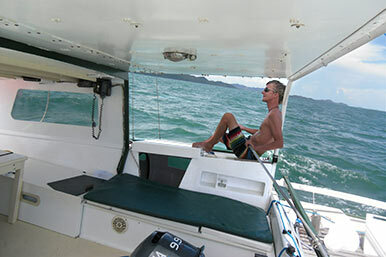 Steering is by tiller, an autopilot is available as an optional extra. 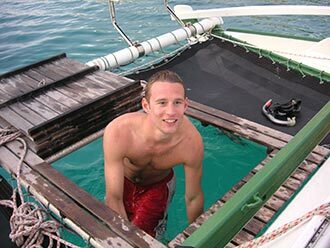 The boat has 2 x 125 ltr fresh water capacity. The fresh water circuit is pressurized, there are 3 outlets. 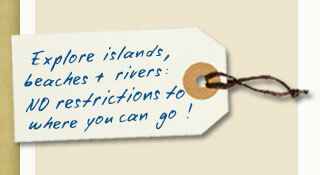 There is a separate secondary circuit for drinking water with one outlet. A very large and efficient fridge keeps those all important beers cool. The total of 300 ampere battery capacity is kept charged by solar panels as well as the engine's alternator. 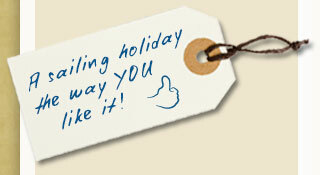 An electric anchor winch prevents straining your back , there are two anchors. A GPS helps to let you know where you are and you will hugely appreciate the graphic depthsounder when venturing in shallow waters. 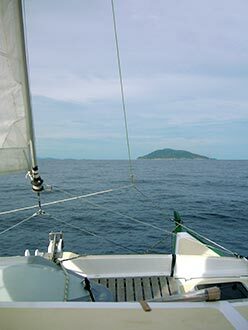 The boat has it's own pre-charged cell phone so it's easy to stay in touch with base at all times. For entertainment there is a CD player, it has a port for an I pod. 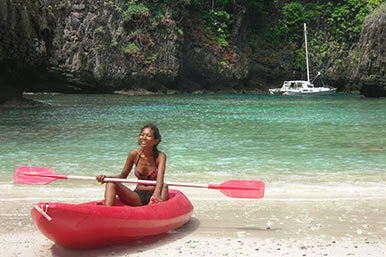 For a tender you can choose between a 2.60m lightweight RIB dinghy + Suzuki 2.5 HP outboard and a 2 pers sea kayak. 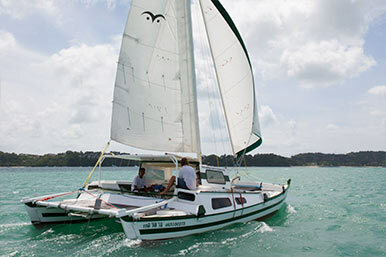 A Tiki 30 has two "friendly" double cabins and, depending on which one of the two you choose, a spacious double bed or twin berths in the deck cabin. Cabins are light and airy with opening hatches and portholes. In addition there is an electric fan over each bed. 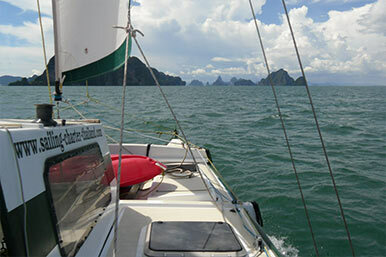 There is one enclosed shower/toilet compartment plus a second freshwater shower on deck. 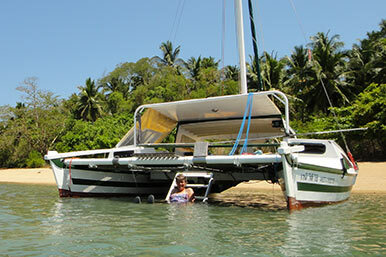 The large cockpit is shaded by a fixed bimini which within minutes can be enlarged to a full -size awning. 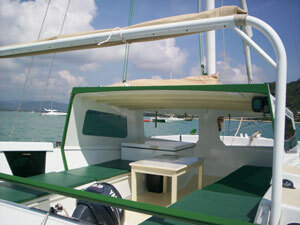 The boat has a well equipped and cleverly designed galley with a two burner stove. The compartments forward of the main cabins provide masses of storage space or can be used as children's cabins.